One additional step for this project would be for the Profile Manager, that is the person who added the Profile or name, is to Add my email address to YOUR Trusted list. into that box and click on “Add this Person”. This is the only way that I can see the information that you just added. No one else can see the details for that person. So excited today. I launched my WikiTree Project a couple of days ago. Invited a couple of, non-FaceBook Generation family members. Had w updates from 4 folks. Wasn’t sure what was going to happen. I happened to notice that one of the FaceBook Generation cousins had a sick child today, based on a FaceBook status. Dropped a email, sent the link to the WikiTree tab, then an invite. Within 10 minutes I had 7 updates, all information that I did not have. Who said Social Media doesn’t work. After spending a bit of time with WikiTree, I have launched a new Tab on my Blog. 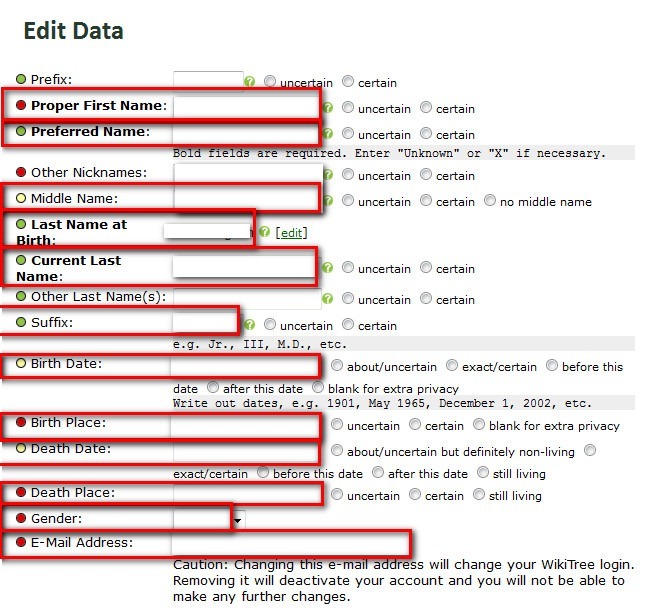 Going to give WikiTree a try for gathering family information for my genealogy management software. I just went live, so the Project has been launched. Will report back from time to time to see how it really works. The Private View has additional information, but you must be on the Trusted List to view this screen. there is a lot of other information on this screen AND places to Add Siblings and Children. If you have Photos for this person, please us the Photo Button to upload them. A future Blog post will provide some directions for that. More information on updating Profiles have been posted on this Blog. The top will remind you whose Profile you are going to Edit. Remember that you can only Edit those Profiles that you have permission to Edit. If you think you should have those capabilities, please send me an email. There are two pieces or sides of this screen. 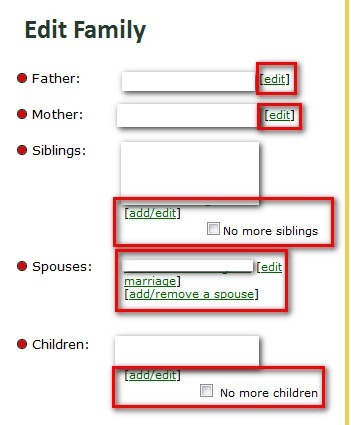 The Edit Data for the Person and Edit Family. First the Edit Data: (the Person’s name is at the top, just above the menu. Each of the fields, if possible, should be filled in as completely as possible. Of course, if the person is still alive, then the Death information would be left blank. In many cases, this information will already be filled in IF I have that information. The purpose of this project, is a way for me to complete the information for my genealogy database, from what the book will be written. Prefix: This would be for a formal title. The Rev., Dr., type of titles. Preferred Name: I go by Russ, so that would be what is in my Preferred name. Last Name at Birth: The Birth Surname. Suffix: Jr, III, IV, 2nd, would be appropriate. Birth Place: as complete as you know it, which would include City/Town, County, and State. As much as you know. Death Place: as appropriate. Again, as complete as possible. Near the Top of that screen is the Private ICON. Select that ICON, and a dot will be filled in. Private: Strictly limited public information. Only the Trusted List can viw or edit the full profile. The default for living people 13 and over, and for non-living people when they’re added as nuclear relatives of living people. The other side of the Screen is the Family. There are links to Edit each of the listed people, and a place to Add anyone who is missing. If there are No additional Siblings or Children, there is a box to check. If you Add a new person, you will be able to Edit that Profile and a screen, similar to the one at the top will appear, except, it will be blank. This is where I want to Thank You in advance to completing this important task. 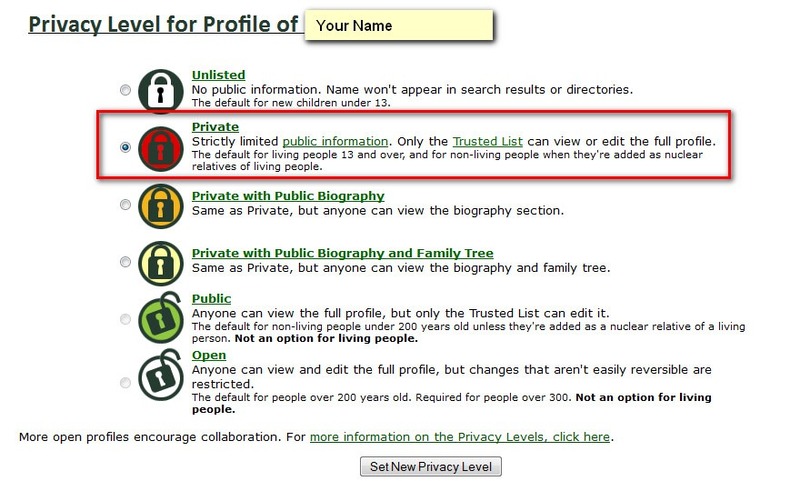 Based on the permissions that you have, you will be able to see your Profile, in the Private View. This is where the details are that only those with the correct permissions can see. I have blocked out the details, but with access, you will see your details. This is from the Right Button that says Profile, Private View. First, note the picture. We have the ability to upload photos. That is done from the Photo ICON. (more details on that later). 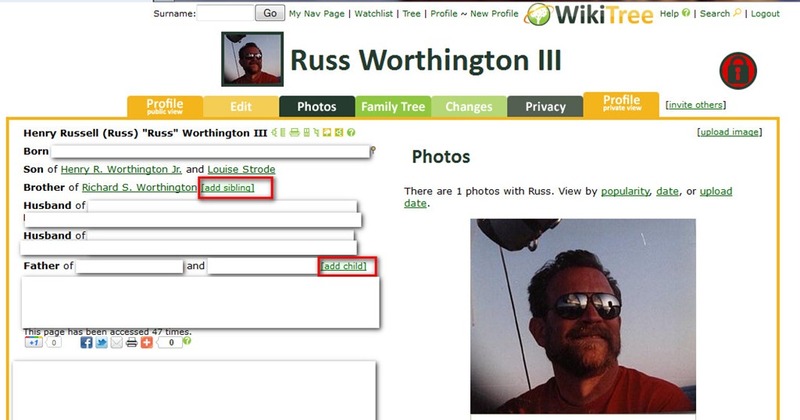 To see other people in your family, there are links on the Left that will allow you to view other profiles. Again, the details are controlled by your permissions. As mentioned before, there is a link on the Left that will allow you to send me an email for that permission. However, you can Add people to your profile, if they aren’t already listed. For example “add sibling” or “add child”. This will give you the ability to Add new people. to your profile. The data entry screen will be in another Blog post. It’s important to mention here, that I will suggest that you change the Privacy Setting (instructions to follow) if you add a new, living person. Living persons are made private, but for now, in this Tree, I will suggest that you make it private. There is a lot of ways to navigate from this screen for updates. While entering this project, it may also be nice to understand who and what WikiTree is. Our mission is to grow a single, worldwide family tree that will make genealogy free and accessible for everyone. Like the Honor Code, it is also important to read the About WikiTree web page. The page talks about the Mission, in more detail, the Community, and the Organization.